What Are The Chances The New York Giants Retain Eli Manning In 2019? 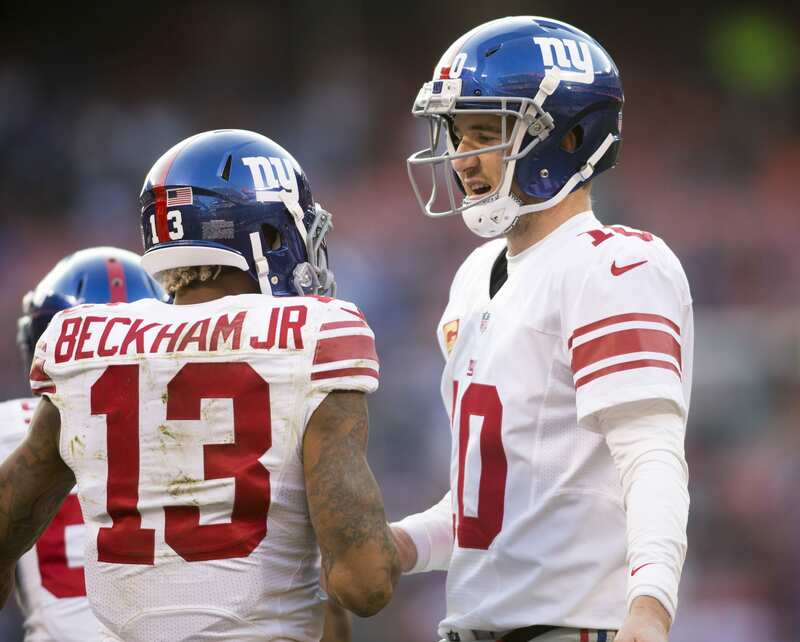 Home New York Giants What Are The Chances The New York Giants Retain Eli Manning In 2019? There’s no avoiding controversy in the New York media market, and for the New York Giants, it’s only about to get worse with the impending replacement of Eli Manning stepping forth. The mathematical elimination from the playoffs will put rookie quarterback Kyle Lauletta in the spot light. The Richmond product has reportedly seen improvements recently, overtaking Alex Tanney as the primary backup for Manning. When asked about a quarterback change after the BYE week, head coach Pat Shurmur didn’t shy away from stating it was a possibility. In fact, he even backed up Tanney, making it known that overlooking him would be a mistake. One week later, the Giants demoted him to the third team. Is Eli Manning really done? The recent surge from the Giants seems too little and too late, but somehow, Manning will find himself in blue once again in 2019. Do I think it will happen? Maybe. One thing I know for sure the veteran’s job security is on thin ice. A majority of the season has seen Manning play at a sub-par level, missing reads and making mental mistakes. Not to mention his vast underthrows on deep-balls. But, we have also seen the two-time Super Bowl winning passer have vintage moments and show signs of life. Does that fact alone earn him a second chance? No, but the recent success of the team might play a part in his return. First off, it’s important that we break down his salary allocations as the Giants don’t have much room to work with in 2019, despite trading away several pricey players. Manning’s cap hit next season is sky-high. He will be earning a bit less than Tom Brady and Russell Wilson, two of the league’s top quarterback. There’s reason to believe Manning isn’t even in the top 15 passers in the league, let alone the top five. The veteran has managed to have himself a solid season thus far, despite the obvious masking of his completion percentage (67.9%) due to an abnormal amount of dump-offs to Saquon Barkley. To be fair, the rookie phenomenon has earned Manning quite the yards-per-catch (7.5, the most since 2011), and sugar-coated other stats on his sheet. Manning will likely see his overall yards land in the same area as 2017 (3,400). His interception percentage is the lowest it has ever been (1.8% of passes). If he can refrain from throwing two more interceptions for the remainder of the year it will be only the second time in career (his rookie season), that he has tossed single-digit interceptions. He currently has eight. What would it take to keep Eli Manning in New York? The scales aren’t in Manning’s favor for a return, unless he takes a massive pay cut that sees him in the $12-14 million range. He would likely be more of a mentor than anything else; waiting for his chance to play once again. I’m convinced he has too much pride to let that happen, which is why he will make his exit. Being that the front-office has made their interest in a new signal caller obvious, Manning must know this will likely be his final season as a Giant, and maybe even as a professional.